Like many cooks both professional and amateur, I love cookbooks. I love reading from them and poring over the writing and photography in their pages as much as I enjoy cooking from them too. Actually, I think I enjoy reading them more than I enjoy cooking from them to be 100% honest. With that in mind, I thought I'd do a series of posts on my favourite cookbooks and to begin, I'm going to start with something that isn't a cookbook as such. 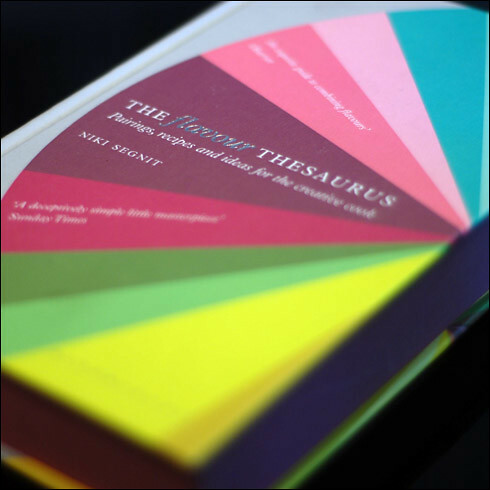 Niki Segnit's "The Flavour Thesaurus" is a new favourite. It's not a cookbook so much as a compendium of combinations that work, both conventional and unconventional. And it's not exhaustive either, which is why I like it so much. What I like best, though, is Niki's writing style. She's funny - she likens the flavour of cloves to sucking on a rusty nail, and that coffee and cherry pie is a combination best shared with Twin Peaks' Agent Cooper (and I'd be inclined to agree) - but she's also incredibly knowledgable and the combination of those two traits makes for a brilliant and fascinating read. The book covers how we come to have certain flavours (coffee and chocolate, for example, are totally different in their consumed to their raw forms) and what it is about each combination that makes it work. It's not a recipe book in its own right, but there are recipes. These recipes are short and succinct. A mere sketchy outline of what to use and do, expecting that the sort of person reading the book should have a degree of culinary knowledge. And indeed, this isn't the book for you if you need someone to tell you how to peel a potato. For me, it's a new favourite, and one that's as at home on the bedside table as it is sitting well-thumbed on the kitchen work surface. To celebrate one year of recording blog stats and a steady climb in visitors over that year, I've decided to host my first giveaway. To be in with a chance of winning a copy of The Flavour Thesaurus, just post a comment below. I'll pick the winner at random on Sunday 17th July. Sounds like a good read. I got the Oxford Companion To Food last year and I can't really find much use for it apart from as a door stop. This sounds more inspiring and useful. Much like your blog!